Six west-side tributaries join Trachyte Creek over a distance of 10 miles, between the UT 276 crossing and the edge of the Little Rockies, and all are at least moderately narrow, if not particularly deep. This region is covered by a large expanse of orange-red Navajo sandstone - mixed with sandy hills and patches of grass in many places, but for two square miles on the west side of the highway the rocks form a higher outcrop, completely devoid of any vegetation; here the surface is just bare sandstone, and the few canyons cutting through are much narrower and deeper, albeit still fairly short. 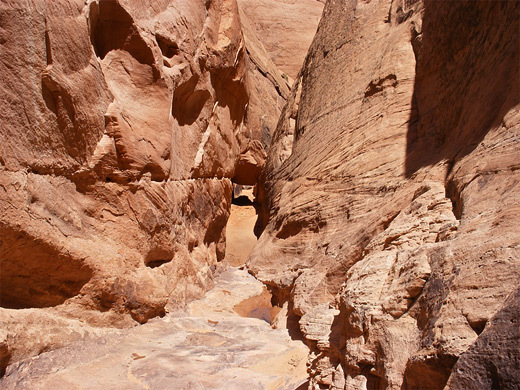 These typically have pools, chokestones, drop offs and some sections (known as Mae West slots) where the passages narrow to just 6 inches or less at floor level, so can only be traversed by climbing some way above, until the ravine widens sufficiently to allow a descent back to the streambed. 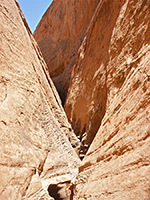 The main slots are formed by two forks of Maidenwater Canyon and a north fork of Trail Canyon; this latter extends for nearly a mile, starting at its upper end by descending quite steeply, including two places where ropes are needed, then leveling out but becoming more confined towards the lower end. For those not rappelling, a reasonable amount of the downstream section can be explored, after just a short approach walk from the road. 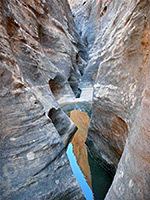 Although brief, this part of the canyon is pretty, colorful and varied in character - it changes from an open V-shaped gorge to a twisty, smooth-sided section containing several watery potholes, followed by an extremely dark and tight passageway where the vertical walls are less than one foot apart, and the rocks overhang above. TopoQuest topographic map of Trail Canyon (the drainage south of 5192T). Trail Canyon crosses highway 276 near milepost 10, just south of the three forks of upper Maidenwater Canyon, and 30 miles north of the end of the road at Bullfrog Marina by Lake Powell. Parking is on the west side right by the streambed, which at this point is quite wide, filled with pebble banks and multicolored boulders. For (free) camping, the nearest suitable places are along a side track 5.5 miles north (see Trachyte Creek), or on several tracks a few miles south, near upper Swett Creek. 11 views of Trail Canyon. 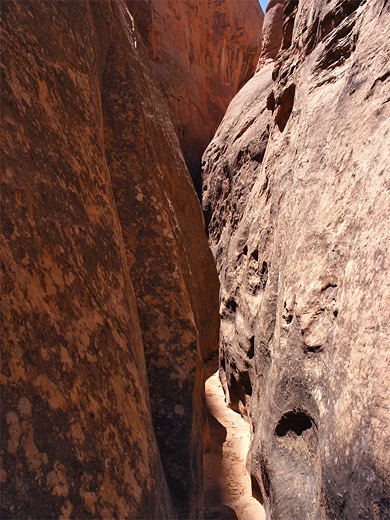 The main drainage of Trail Canyon runs just south of the Navajo sandstone plateau and is not at all narrow - the slot is along a branch on the north side, which forks off 1,000 feet from the road. This splits again as it enters an area of low, sandy hills; the left fork leads to a short, shallow, narrow channel interrupted by several chokestones, while the larger right fork heads further north into the high slickrock area, between many high sandstone domes. This drainage starts to constrict about half a mile from the highway, and has passages typical of this kind of terrain, with smooth sided peaks high above sloping steeply down to the streambed, the course of which is generally straight and the canyon open, sunny and free of shadows since there are no overhanging rocks. At floor level though the gorge soon becomes quite twisting, forming tight S-shaped curves, in places holding pools sometimes several feet deep. A few chokestones partially block the streamway but there are no major obstacles. A little side ravine joins on the north side, after which the main drainage opens out temporarily though is still completely without any grass or bushes - the landscape consists just of rock, sand and sky. Next, the streamway closes in abruptly as the walls become vertical for many feet above, the rocks darken and the passages are now just a few inches wide so the canyon is rather gloomy, usually filled by one or two feet of water. Thin people can squeeze through for 40 feet or so before the opening gets too narrow, and as there are no easy routes to climb above, no more can be explored, unless starting from the top, after a one mile walk over the undulating slickrock on the south side of the canyon. In general, Trail resembles many other ravines in this area, around North Wash, Butler Canyon and Poison Spring Canyon, where small, seasonal streams flow across relatively soft slickrock to form some of the narrowest slots around, all fairly short but needing quite a lot of effort, experience and technical ability to explore fully.